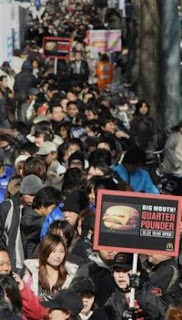 Around 1,000 people were paid to join the queue outside the Midosuji-Suomachi branch of McDonald’s for the release of their Quarter Pounder burger in the Kansai area on Tuesday, it was learned on Thursday. The company has admitted to the fact that around 1,000 people who lined up on Tuesday were compensated, but claims they only made a request for consumer feedback to one of their marketing companies. There are suspicions however that the people were employed to help promote the new product, serving a role known as “sakura” in Japanese. It is estimated that as many as 2,000 people were lining up outside the McDonald’s store at its peak on Tuesday, and that around 15,000 people in total visited the store during the day, setting a new record for daily sales for one of their stores. But it was learned on Thursday that about 1,000 of the people queuing outside were paid an hourly wage of 1,000 yen and also had their purchase paid for. These people were hired by a human resources company at the request of a marketing company commissioned by McDonald’s Japan.